​It has never been easier to come fishing with us. We tailor unforgettable adventures to suit your needs, time and budget. Whether it's a week or two staying in luxury lodges or a day-trip to one of the local rivers we will customize a trip for you - we do not think that "one size fits all !". Get in touch and let us put a personalized itinerary together for that fly fishing trip of a lifetime..Coyhaique and its outstanding fishing is awaiting for you. With us you will enjoy our Patagonian culture as much as the quality of our world-class waters!! My friend and client Cassio, with a fantastic brown trout. I wanted to thank you for the best trip Blackwell and I have taken together. I have to admit I was nervous about a full week of Chile fly fishing , but after a week fishing with you, I can honestly say I'm hooked. Thanks for all the effort you put in to show us your beautiful country and your patience with me, as I master the art of fly fishing. The riverside lunches were delicious and the wine the perfect compliment. Now I look at our pictures and I can only dream of returning to Patagonia. ​We will definitely be back!" Please, check our latest video where you can find a brief description of who we are and what we do...Enjoy!! Patagonia portrait from Calero Photography on Vimeo. Reasonable rates with excellent quality. A wide range of places to stay: hotels, hosterias, cabins and lodges. Fish with the best - English speaking - fly fishing guides. Fishing diversity that only Chile has to offer. Wonderful Chilean cuisine in our traditional restaurants and lodges. The money you spend here, stays here in Coyhaique - helping the community! Myself holding a great brown trout. 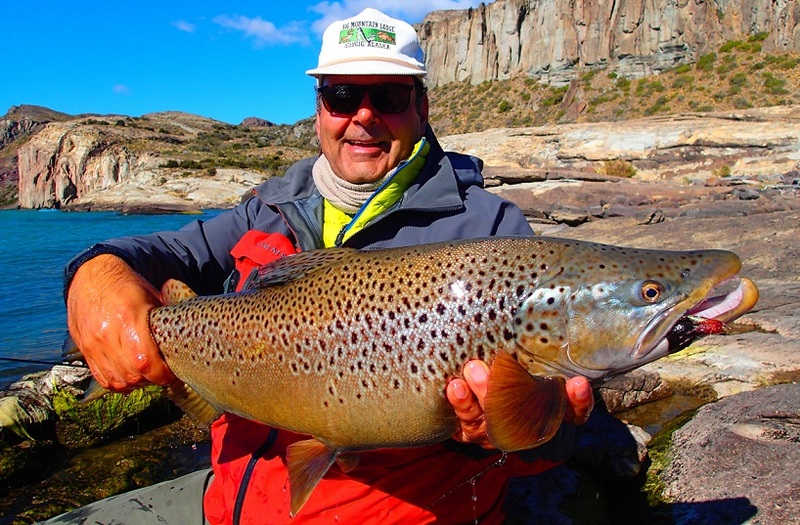 Our aim is to give you a good introduction into the exceptional Patagonia trout fishing, and the services we offer. This web site is a fine blend of information, jokes and exciting photos about what is waiting for you. As fishermen our spirits soar at the sight of a rising fish and our hearts race at the take of a fine trout. As guides we want you to share our Chilean experience and enjoy the pleasure of casting a 16 parachute dry fly a foot above a 20" plus trout, watching and waiting for that dramatic second, when there's nothing else but you, the fly and the trout. ​Chile is one of the safest, most friendly, yet isolated and hauntingly beautiful regions of the world. And Coyhaique, the capital town of the Chilean Patagonia region, is easily reachable. After only a 3 hour flight south from Santiago to the Balmaceda airport, you can be here, fly fishing in our paradise. What is the best way to communicate with a fish?